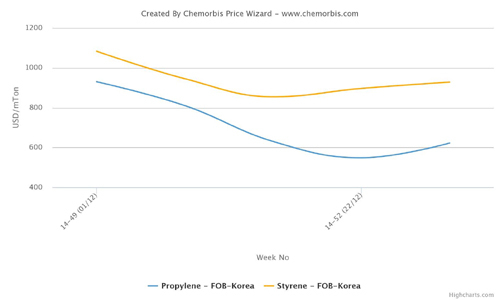 ChemOrbis Price Index shows that the downturn that has been in place since late summer in the polymer markets has had a larger impact on PP with respect to PE. The largest loss was recorded in Turkey’s PP market, even surpassing the cumulative decreases posted in China’s and Southeast Asia’s PP markets. The downward trend kicked off in Turkey’s PP market as of the first week of August 2014, when players returned from a week-long Eid holiday. 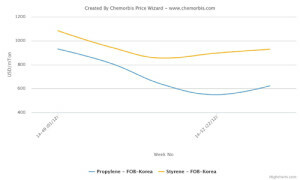 Import PP prices have lost ground by 37% for raffia and 43% for fibre so far based on average ChemOrbis Price Index. In comparison, import PP prices in China and Southeast Asia have retreated by 33% on average since early September, when the downturn first started. In the meantime, PE prices recorded a cumulative decrease of 27-29% in China and Southeast Asia. Turkey also followed suit and fell by 25-29% in the past 5 months. Players both in Asia and the Middle East also affirm that the downward trend in the PP market has been sharper than in the PE market. “The low end offers we receive at the beginning of the week end up being the high end a week later in the PP market,” concur players in Turkey. PP buyers generally feel regretful about each purchase they make since the gap between the cargoes sitting in their stocks and the ones on the way has been quite wide. When it comes to the reasons why the PP market’s loss ended up being larger than PE, China’s new capacity additions for coal and methanol to olefin/polyolefin plants were the main reason cited. As was already noted in ChemOrbis Daily News titled Coal based capacities weigh down more on PP than HDPE in China , there are larger capacities coming online for PP. The second reason was the fact that propylene fell a lot more than ethylene in Asia. Apart from methanol and coal to olefin units, there have also been new PDH units that make on-purpose propylene output, which rendered supply for propylene comfortable across the region. Apart from these, HDPE production was disrupted in many regions for the most part of the second half of 2014. Tighter availability for this product as well as the already restricted capacity for LLDPE and LDPE across the board kept the downturn relatively limited for PE when compared to PP. In terms of demand, PE demand can also be considered relatively better than for PP, which is because PE is consumed more in fast-moving consumer goods due to its wider share in the packaging applications. This is another reason why PP lost more ground than PE both in Asia and the Middle East in the past five to six months.